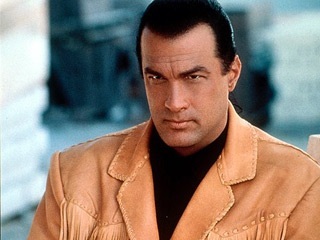 FIRE DOWN BELOW is a moronic Steven Seagal movie (as opposed to all the ‘good’ ones) from 1997. Here, the lock-jawed, blink-free avenger plays an EPA agent (sure, and I climb the Empire State building this Saturday) who goes to Appalachia, undercover, where according to the script, he will fit in without suspicion among the locals. He’s there to—does it matter? It was a big flop at the box-office, making only $16,000,000 on a cost of $60,000,000. Pow! Whack! Kris Kristofferson is the bad guy, Marg Helgenberger the requisite babe. Oddly, apart from kicks and wrist-snaps the movie has pretensions of seriousness and there’s a decent supporting cast of folksy types—Harry Dean Stanton, Levon Helm, Stephen Lang—plus a quite good array of still photos that adorn the end credits. It’s almost worth peeking at for that last five minutes alone. Or…you could just go in the backyard and step on a rake. Directed by Felix Enriquez Alcala at 105 minutes. Maybe the truck will fool ’em.